When we were little we couldn’t wait to get bigger. We were young people waiting to be old, old enough to drive the car and go on a date. We were unsophisticated, naive, inexperienced and unconscious of the outside world. We existed mostly in our Ego’s back then, worrying about nothing much more than where the next party was and how late we could stay out. We didn’t have a clue what life was really about, our Tribe kept us fed, warm, they provided us with a bed to sleep in and a roof over our head. If anyone had said to us all those years ago, when we were young, ‘the key to growth is the introduction of higher dimensions of consciousness into our awareness’; we would have thought they just stepped out of the movie, One Flew Over the Cuckoo’s Nest, I could see us quietly backing up and walking away with a very quick step in our bounce. It isn’t till later on in our life, as we get older that we start to question our existence and ‘what is life all about’. Perhaps the time does come when we wonder about Spiritual growth and how in the world we go about achieving it. 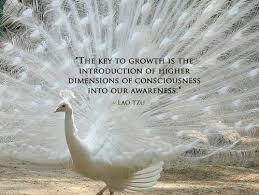 Becoming conscious is to become aware of our surroundings. To be awake and mindful enough to want to change the way we think, we live and how we feel about ourselves as a whole person. When we come to understand that everything that happens to us is purposeful to the growth of our Soul, then a degree of unconsciousness slips away with that awareness. It isn’t about waking up and rubbing our eyes, it’s more about going behind the eyes to connect to what is in that place. Seeing the World from a dimension other than our Ego state of mind. Life brings us signals and signs to help us along our way. Synchronistic events that often times can blow our minds. Not knowing what they mean right away is a puzzle, it is up to us to put the pieces together. This morning I laid in bed pondering about something that has been on my mind. I was staring out my bedroom window looking up at the brilliance and quantity of stars. Out of the corner of my eye I noticed a tail of light, I smiled and thanked the Universe. A falling star to to help me on my journey.